Becky Maltby as the Devil in "A Soldier's Tale." "Igor! The Genius of Stravinsky"
The Devil offers a young and impressionable soldier a stock portfolio worth a fortune (even in these times) for a violin he bought in a Kailua pawnshop. Therein starts a classic tale of temptation and disillusionment, as Chamber Music Hawaii ends its 20th season with something out of the ordinary. As part of an all-Stravinsky program Monday at the Doris Duke at the Academy, an adaptation of "A Soldier's Tale (L'Histoire du Soldat)," originally a collaboration between the Russian master and novelist Charles Ferdinand Ramuz written during and inspired by the events of World War I, will be presented, albeit with an updated, local flavor. That's provided by Ann McCutchan, a former Hawaii resident and member of Chamber Music Hawaii, invited back from her teaching post at the University of Wyoming to write and direct this commissioned piece. Her contemporary, Hawaii-based adaptation is just one of several updates of the old Faustian tale of selling one's soul to the devil that Ramuz himself based on a Russian folk tale. Kurt Vonnegut, in his own contemporary adaptation, set the story in the following world war with an American GI as one of his protagonists. Stravinsky and Ramuz wrote "L'Histoire du Soldat" in such a way that small groups of actors and musicians could produce and tour throughout Switzerland with minimum expense. The Honolulu performance will mirror those small ensembles, with conductor Stuart Chafetz, who will also be playing the part of a restaurant waiter that prompts a patron, the Narrator (Sylvia Hormann-Alper), to tell her Faustian story of the Soldier (Michael Hanuna), the Devil (Becky Maltby -- also playing a beach bum) and the Governor's Daughter (Minou Lallemand). 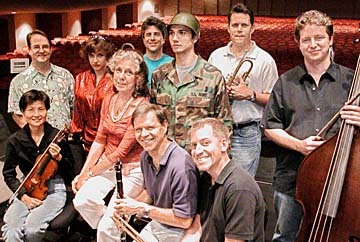 All ready to rehearse "A Soldier's Tale," are, clockwise from top left, Jonathan Parrish, Becky Maltby, Sylvia Hormann-Alper, Jim Decker, Michael Hanuna, Mark Schubert, Mike Gorman, Riely Francis, Jim Moffitt and Claire Sakai. IN TALKING with McCutchan, she obviously delights in switching the tale to a tropical setting she knows well, from the French countryside of the 1917 original. "My version is also different in that the original had only three characters, the Narrator, the Soldier and the Devil," she said during an afternoon rehearsal at the Musicians Association building. "I had the Devil to be able to play both male and female roles, and a nonspeaking but dancing role for the princesslike Governor's Daughter." Another liberty McCutchan takes with the original is having the Soldier make a comedic transformation into one of those unctuous financial workshop "consultants," shilling his book entitled "One Dang Good Principle for the Success of Life." McCutchan, here from 1990-92, worked with Chamber Music Hawaii and also wrote the lyric text for Dan Welcher's "Haleakala: How Maui Snared the Sun," premiered by the Honolulu Symphony 12 years ago. Besides currently being a professor in both the music and English departments at Wyoming, she's authored a couple of books, as well as several essays and critical pieces. Her take on "A Soldier's Tale" promises to be a lively segment of music, drama and dance, with performances of Stravinsky's "Septet" and "Ragtime" rounding out the evening's program. The question is, Which road will the Soldier take that will ultimately determine his fate, the one that will lead him back to the love of the once-ailing Governor's Daughter or the one the scheming Devil has set out for him as a so-called businessman? All will be known Monday.